No. We believe in offering all our customers the same opportunity. Does Absolute Estate Sales offer discounts at their sales? Yes. We offer progressive discounts for the duration of the sale. What is the fee or commission for a sale or services? After a free consultation of your estate property we will discuss your options and offer a set commission tailored to your needs without any up-front fees. 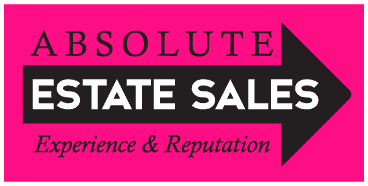 Is Absolute Estate Sales licensed and insured? In what type of estate property does Absolute Estate Sales specialize? We are able to host a sale with items ranging from vehicles, and antiques, vintage, and modern furniture, collectibles, household and more. Overall, we can work with a variety of estate contents. Can Absolute Estate Sales sell my home? Yes! You can provide a realtor or we can recommend one. We will prominently display your home’s information at our desk and the sale serves as a 2-3 day open house. Our clients have experienced great success in selling their homes from this service. Your house sales information will go out to our 6,000 past customers. What time of year do you host sales? We conduct sales throughout the year, during winter, spring, summer and fall. How far in advance does a client need to schedule a sale? We would prefer as soon as possible to ensure we are able to select and save a date that best suits your closing date or schedule. Additionally, we understand if you are working within strict time limitations and will work to reach these deadlines together.